Fort Lauderdale, FL – Like a Cyber Monday deal at the gas pump, the cost of driving went down for a second consecutive week, according to the latest weekly fuel price survey from the U.S. Energy Information Administration. The average price for a gallon of regular unleaded is now $2.53, down nearly four cents over the past week. While prices in most of the survey regions declined by a more modest figure, a substantial decline in prices across the Midwest, of more than seven cents per gallon, helped pull down the nation’s average retail gas price. Most regions’ fuel price averages were off by one to three cents per gallon. Truckers got only bad news in this week’s E.I.A. report. Region by region, prices were up from one to three cents, pulling the nation’s average price of diesel up to $2.93 per gallon. Fuel prices for all regions are shown below, as gathered from www.eia.gov. 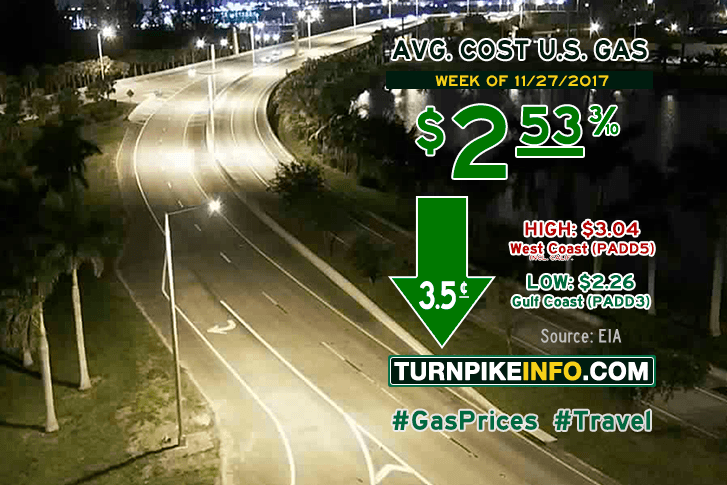 Fort Lauderdale, FL – Just in time for the Thanksgiving holiday, the nation’s average fuel prices relented in their recent spate of price hikes. The latest report from the U.S. Energy Information Administration shows the national average price for a gallon of regular unleaded has fallen about two cents to $2.57. The decline marks the first time in November that drivers have received any good news, where it concerns gas prices. Fuel prices were down across nearly all of the E.I.A.’s survey districts, including the West Coast, where average prices slipped over the $3.00 mark earlier this month. Prices were flat across the bulk of the Rocky Mountains. Truckers got mixed news from this week’s E.I.A. report, however, as the national average was flat. 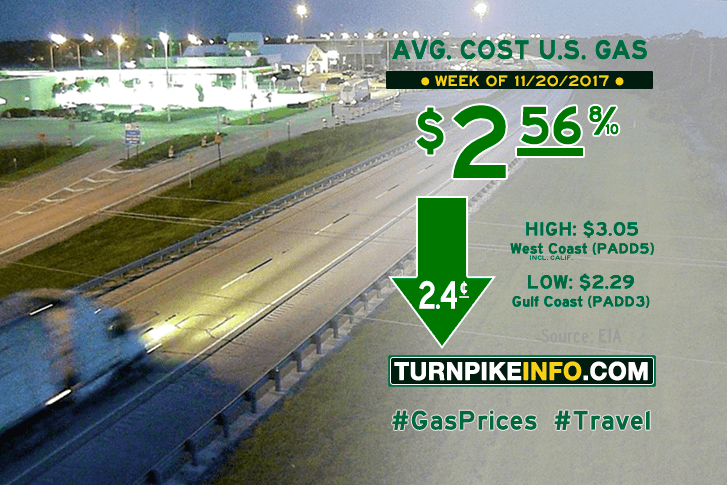 Region by region, prices were down about a penny across the West Coast, Midwest and Gulf Coast; however, prices surged along the Lower Atlantic by nearly four cents, while the broad East Coast saw diesel prices up by over a penny per gallon. According to the E.I.A., the nation’s average cost for a gallon of diesel is now about $2.91. Fuel prices for all regions are shown below, as gathered from www.eia.gov. Fort Lauderdale, FL – The nation’s average fuel prices lurched upward once more during the past week, according to the latest fuel price survey from the U.S. Energy Information Administration. The weekly report shows U.S. fuel prices went up another three cents this week to about $2.59 per gallon. If there is any good news in the report, it is the fact this week’s price hike is less than half the increase drivers felt last week. Regionally, that is likely of little comfort where prices went up the most, such as in the Lower Atlantic states. Drivers in places like Georgia and Florida witnessed an average price increase near to ten cents per gallon, the highest in the nation this week. Prices along the Central Atlantic jumped by about five cents per gallon. Truckers felt another, similar price hike at the pump this week, as prices for diesel jumped over three cents per gallon, as well. According to the E.I.A., the average cost for a gallon of diesel is now about $2.92. Fuel prices for all regions are shown below, as gathered from www.eia.gov. 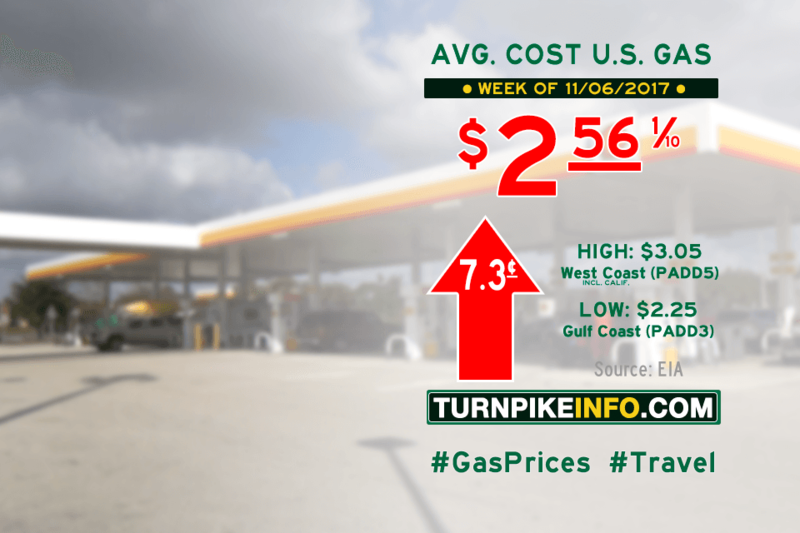 Fort Lauderdale, FL – The nation’s average fuel prices surged during the past week, according to the latest fuel price survey from the U.S. Energy Information Administration. The E.I.A. weekly report, which surveys fuel districts across nine regions and sub-regions, found spikes in gas prices in California and across the Midwest were major factors in this week’s seven-cent price hike. The nation’s average gas price now stands at $2.56 per gallon. Regionally, drivers across the broad West Coast region, which includes California, saw prices lurch upward over 12¢ per gallon to settle over the $3.00 mark for the first time in weeks. As a region, the West Coast prices are the highest in the country, averaging about $3.05 per gallon of regular unleaded. On the other side of the spectrum, prices along the Gulf Coast increased modestly to an average of $2.25 per gallon. Truckers felt an equal amount of pain at the pump, as prices for diesel jumped over six cents per gallon, on average, this week, according to the E.I.A. The average cost for a gallon of diesel is now $2.88. Fuel prices for all regions are shown below, as gathered from www.eia.gov.